Budapest has a wonderful fin de siècle atmosphere, and you’d almost expect ladies in crinolines to come sweeping along the riverside promenades. But this city is so much more, with a dark veneer of Communist history and a modern, stylish present that makes this one of Europe’s most impressive capitals. We’ve just covered the sights of Buda on the western banks of the Danube in a previous post. Now it’s time to hoof across the river to explore Pest on the far side. Stop off first at Margaret Island in the middle of the river, which has green lawns and beautiful flowerbeds – just the place to rest weary sightseeing legs. From here, you can admire Hungary’s neo-Gothic parliament building, very reminiscent of London’s Houses of Parliament. Charming country traditions that sit alongside a veneer of Western luxuries and trends in Pest. Locals pickle vegetables in jars and set them on their windowsills, and frequent neighbourhood markets bursting with fresh food, clothing, junk and occasional Communist-era memorabilia. (The enormous suburban Ecseri Market is worth the trek to rummage among porcelain, antique silver and books.) But the younger generation also throw themselves into film festivals, fast food and fashion shows, and consider themselves the cool people of Eastern Europe. 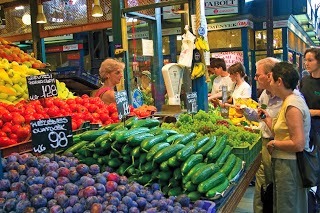 A Pest fruit stall, Budapest, Hungary. Everywhere in Pest you get glimpses of the city’s extraordinary former grandeur: sumptuous apartment blocks, Hapsburg eagles glowering on rooftops, and winged cherubs grinning from church ceilings. Walk through Pest and you also get the perfumed whiff of flower stalls and roast coffee from stylish cafés, where you can nibble on cream cakes under ornate ceilings. This is a city of slow pleasures: riding a rattling tram, picnicking in a park, or browsing antique and jewellery shops. Of course, like any city, Budapest has its dark side. 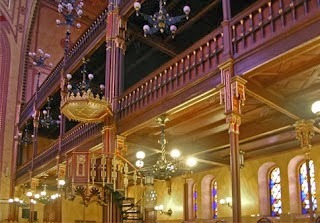 Visit Dohány Synagogue, Europe’s largest, reconstructed after being desecrated by the Nazis. A willow tree sculpted in metal in the courtyard is a memorial to the Holocaust, while the adjacent National Jewish Museum has moving exhibits. Budapest has one of Europe’s largest Jewish populations, and the rather run-down Jewish neighbourhood is atmospheric and haunted. Dohany Synagogue in Pest, Budapest, Hungary. As for the Communist era, Statue Park is Budapest’s iconic repository of leftovers from Soviet days, littered with Communist-era statues and memorials that once dotted the city, from busts of Lenin and Marx to statues of revolutionary workers. For a little light relief, and for a flavour of imperial times, a night at the opera is unbeatable. Red carpets flow up sumptuous staircases, and everywhere the décor is a dazzling collection of gilt and inlay, cornices and curlicues. During the entr’acte, you can have a glass of Tokay and a marzipan cake, surrounded by red silk and gilt-framed mirrors. Missed our post on Buda and its chief sights? 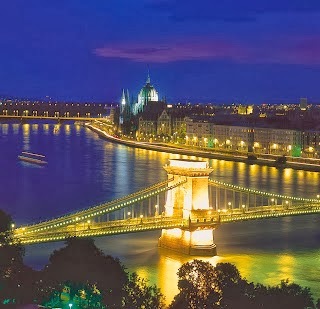 Click here and it will take you the more on Budapest.